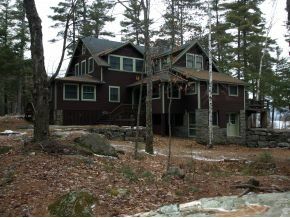 Vintage Squam Lake Lodge, one of the great Squam Lake estates. Owned by the Hartshorn family for over 100 years, it is comprised of 11.8 acres with 2043' of prime water frontage on Squam Lake. View across miles of open water to the Squam and Sandwich Mountain ranges. Private location with 2 forested points and 2 coves. One cove protected by a breakwater with a boat dock, the other has a beautiful sandy beach with building for storage with changing rooms and covered porch. The main house has an 874 square foot wraparound porch facing north and west, six bedrooms and two and a half baths, and a fireplace made of lake stone with a mantel cut from local granite ledge. The garage has 2 bays and guest quarters behind with fireplace and 1/2 bath. Property subject to conservation easement, but subdivision of a 4 acre parcel to the north is possible with building and dock area not subject to easement as well as 2 ac. surrounding the existing structures. Permit in hand for an additional 4 slip dock and breakwater renovation. Listed by Coldwell Banker. 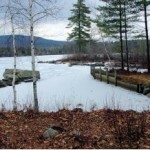 Squam Lake often referred to as On Golden Pond is the second largest lake in NH, just over 6000 acres. 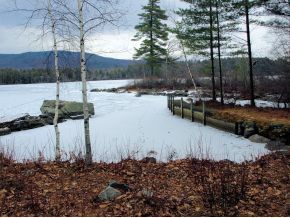 Squam Lake has islands to explore and the shoreline a miles of open space. 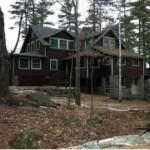 For additional information on this home call Lady of the Lake Realty at 1-888-737-5550 or e-mail at info@nhlakesrealty.com or visit our website to view similar lake homes in New Hampshire at https://www.nhlakesrealty.com/ or www.lakeorskirealestate.com. Contact us today to see if this home is still available? ?